That’s how many hours I have before class starts. I’m already at school, outside the classroom, waiting. Why? I had homework to do and the weather was supposed to be bad, so I came early. Benefit? I got a good parking space and didn’t have to walk across campus. I also managed to do the homework. But now I’m going to be bored. Yesterday, I was very bored. I started watching a documentary about dirt and then watched a few TED talks. I also did nothing. It was not fun. Now, what to do with my two hours? Well, I suppose I could do some other homework, but that wouldn’t be waiting until the last minute, and that’s just not my style. Also, homework is boring and I can only handle so much at a time. So I type here. About nothing. Yay. I guess I could tell you about my homework. That’s kind of like doing it, right? Well, for this pluralism in education class, I get to make a gender collage poster thing about females. It’s supposed to be about stereotypes, expectations, etc. This, to me, is boring. I don’t even have any good magazines to cut up for this project (National Geographic doesn’t have many clothing ads…or women at all). I think it’s more interesting to show the pictures women aren’t in…the explorers, the business men, the cars…but I’m supposed to use images of women. The guys in the class are doing posters of maleness, so I can’t infringe on their pictures, I guess. Obviously, there’s tons of stuff online that I could use (just go to Pinterest and search “Real woman”), but then I have to print it and it’s not the same quality as the magazine images. Maybe that will work…if my printer cooperates. I think it may be running low on ink. In my drawing class, our out of class assignment is a self portrait through the torso (our first was just the head/neck). Contrary to what the syllabus says, we can be clothed, which is nice…but makes it harder to choose. I’m not good at choosing. Contemporary art is interesting but too short. The readings are interesting but too long. My other education classes are okay. In one, I’m going to do a case study of an adolescent girl I used to babysit (now she is a babysitter), so that should be fun. I also have to write a personal philosophy statement of 500-1000 words about good teachers. That’s probably going to be less fun. 15. It’s only been 15 minutes. Okay, I’m going to go peruse the webs and watch some TED talks or something. Maybe I’ll find something interesting to report back on. Probably not. My hand hurts again…but that’s not what this post is about. Well, it’s not really about anything in particular, like most of my posts…oh well. I’ve been having a lot of trouble getting classes and things for school because I’m a “special student” aka I already have a degree, but I’m not a grad student, so I’m in limbo. Finally, I’ve found the right people to meet with (I hope) and have appointments scheduled with them today and tomorrow. I hope this gets everything for the rest of my time at this school figured out. Otherwise, I might transfer to another university that seems a bit more together. But who knows if that would really be better. Part of the problem is that the coordinator for art ed. is new, and she didn’t know fully what her role was. Plus, the help desk told me to contact the wrong person. Plus, people just shuffled me to others without really helping me. Plus, people stopped responding to my emails. Plus, my advisor didn’t know anything. Plus, the website’s not entirely up-to-date. Plus, I have anxiety over things like this, like using the phone and such, so that didn’t help. Overall, it’s been very stressful, but I’m hopeful that I’m on the right track now. The lady I’m meeting with tomorrow seems to be knowledgeable and helpful, so that meeting should go well. In other nonnews, I’m hanging out with my best friend since kindergarten tonight. That’s always a fun time, and, although we now live in the same town, we don’t see each other very much, so I’m really looking forward to this. I’d best get going now. Need to drive to my meeting and such. I had to get up early today so that I could get to school early so that I could unwrap a clay cup and wait for it to dry. My life is so exciting. On my way to school, I missed my exit and had to drive at least 10 extra minutes to get back to where I needed to be. Oh the horror. An update on ceramics, because you really do care oh so much: I carved four of the teacups I needed and they’re not too ugly. I carved a hole into one, so I had to throw a new one (that’s the one that isn’t dry yet). Once it’s ready, I have to trim it and carve the foot and then carve the body to match the others. I spent hours trying to make satisfactorily hand built teacups, but they were all ugly or fell apart or both or something else, so I gave up on Saturday and went home. I took clay home with me and yesterday, instead of driving to school, stayed home and managed to make five pinch pot teacup things with the help of custard bowls. They aren’t too bad. So that assignment’s almost done, which is good ’cause it’s due in half an hour. I probably won’t have that last cup done because it’s still too wet to trim and there’s just not enough time to finish it before class starts, but at least I have most of it done and can probably finish that one cup today. We will probably be having demos for teapot making today, too, so that’ll take some time, and we’re unloading our first glaze kiln probably, so that’ll take some more time. Maybe I won’t actually finish that cup in class, but probably this afternoon. Maybe. The art department chairperson still hasn’t emailed me back telling me where her mailbox is, so I guess I’ll just have to go to her office this evening and hope she’s there at the time she told me she could possibly meet me. I need to get those forms signed before they decide I’ve taken too long and try to make me keep the class and get an F. That wouldn’t be the best way to start at this new school, and I have a legitimate reason to drop. If anybody reading this (if anyone has read this far) is an expert paper pop-up maker or something like that, I could use your help. For my drawing class, I’m making a pop up page of an ancient Greek statue hitchhiking on a modern countryside. Yeah, it’s weird, but those were the words I ended up with. So what I need help with is making the illusion of depth beyond the flat pieces popping out. I just can’t seem to get it to be satisfactory in my mini models. I have class tonight, work time tomorrow, and critique on Wednesday, so I need to get this figured out soon because I haven’t started drawing the pieces or background yet (because I don’t know how big they should be or what they should look like. There’s nothing to report going on in my special ed. class. I’m going to try to talk to the teacher today about the test questions I don’t understand. I was going to do that last week, but she seemed busy and we only had class one day. I was also going to print the email I sent her for reference, but I forgot, so I guess I’ll just have to use my computer to access it and get the specifics, ’cause I certainly don’t remember anymore. I still have about 15 minutes before I need to head to class. I would go now, but there’s already a class in there working, and I don’t have anything to do in the studio (I’m pretty sure the cup won’t be ready, and even if it is, there’s not enough time to finish it). Oh well, guess I’ll stay here on the computer. Also in the realm of helping me, if you have any ideas for crafts/art projects to do with adults with (mostly cognitive and some physical) disabilities, or know where I could find a good source or two with ideas, please let me know. It’s not that I don’t have ideas of my own, but I’m always looking for more and better. I have a few posts saved as drafts that I think will be actually interesting and informative, not just telling of my exciting waits for clay to dry, but they’re long…and I keep losing attention and/or getting overwhelmed by them. I’m worried that they’ll lose their interest and meaning because the timeliness of them will be ruined by me taking so long to finish and post. Oh well. That worry’s not going to change anything; I just thought you’d like to know. I suppose I can start packing up and heading to class now, so I guess I’ll publish this. Since I did this post this morning, maybe I’ll work on one or more of those in progress posts this afternoon. Or not. I’ll see. And you may, too, eventually. Right? Well, no, but…nope, can’t even pretend. I was late for class this morning because, after I got up and started getting ready, I was feeling very anxious and decided to “rest for a few minutes”…a few minutes turned into almost an hour, and it wasn’t even restful. I do not like this. The anxiety I had was a carry over from yesterday and worry about today, plus just general anxiety about nothing in particular. You see, in my art metals class, I have two projects due on Tuesday. We’re not allowed in the studio on the weekends, so that leaves this afternoon and part of Monday afternoon (and possibly Tuesday morning for a bit, but not enough to count on) to finish. I worked for four hours yesterday trying to cut a fish shape out of brass to fit inside the same shape cut out of copper. I just could not get it to fit. Besides this being quite frustrating, I’m terrified of what I have to do next, besides finishing the fish-cutting: I have to solder. As I’ve mentioned before, soldering (and annealing, which I also have to do) requires the use of an open flame, a torch that I will hold and control. I do not like hot things; not campfires, not ovens, not hair dryers, and certainly not torches. I have been putting this off for the past month, not working in the most efficient ways because I was avoiding the flame. Well, I’m past the point of avoiding now, and I didn’t even ask anybody for help, so it’s all up to me, today, to start/finish the work. I’m going to start with annealing and see how that goes, since it shouldn’t take too long and doesn’t require as much control and directing of the flame to draw the solder around the seams. But I’ll still have to solder today. Yay. Honestly, I am so scared, and, if I could drop the class without it showing on my transcript, I probably would. But it’s past that point and I just have to get through this or fail, and I really don’t feel like failing one of my first classes at this school. Plus, it’s something I should know how to do in case I ever need to teach it or want to use it in my own work, and I really want to work on getting over/through this fear. In my last art metals class (which I dropped when we got to soldering), I did handle the torch and solder a bit, but I was scared then and don’t really remember any of it. So it’s like I’m doing this for the first time. And it’s scary. Very, very scary. I also have two writing assignments to do for my special education class that are due at midnight tonight. I was going to do them yesterday after I left metals, but I was still quite anxious and couldn’t concentrate, so I didn’t. That means I have to fit those assignments in today, too. The metals studio closes at 9pm, so I could have an hour or two to do the assignments tonight (if I stay in metals all day), but I don’t know if that’s enough time, if I’ll be too anxious, or if I’ll be too tired to do the work then. So I should do that this afternoon, maybe as a break from metals, like while my soldered and annealed copper is in the pickle solution (to clean it after touching fire). Or maybe I should do it now and avoid the flame a little longer. After all, it’s already past the time I was planning on being in the studio, so what’s another hour or two away? Actually, I wasn’t going to be in the studio until about now, but my class ended early, so I’ve been ready to go to the studio for an hour or so. Except I’m not at all ready…but I can’t wait until I am, because that time will probably never come. So here I am, sitting on my computer and trying to type through my feelings to…what? make it easier to go and do the work I need to do? I don’t think that’s going to happen, but maybe that’s my hope. I don’t know. Well, I need some clay to dry out a bit first, ’cause it’s really wet right now and the stuff I’ve already thrown that needs to be trimmed isn’t dry enough for that, either. So I wait. My thumb hurts. Tuesday night, I sliced it with an X-Acto blade while carving cupcake stamps out of erasers, and yesterday I stabbed it with a broken saw blade while cutting metal into fishy shapes. Now, I’m playing with clay. So much for the whole Band-Aid idea. I finished my drawing in class yesterday. Turns out, the professor’s leaving the still life up until Monday morning, so I could have kept working on it, but I was done before class ended. Sure, there’s more I could do to it, but I didn’t feel like it. I also bought the conté crayons yesterday and have started making the assigned color wheels. I’ve made a lot of color wheels and such things in the past, mostly because I took a class about color theory at my last school (I don’t think this place has such a class), so this is a bit boring. But whatever. He just wants us to get used to the color selection and how they color. Well, I’ve done four of the six that I need for Monday and I think I’ve got it figured out. I can imagine some people in the class, though, not having had as many art classes as me, may not be as familiar with color mixing and such, so hopefully this short project helps them make better projects in the future. I have four bowls thrown right now, and one of them is trimmed. However, I flipped that one over a bit before it was ready, so now the top is icky. I’ll try to fix it once it dries a bit more. If it doesn’t work, at least it was good practice. I also tidied up my pitchers a bit. They’re drying now, and, once they’re dry, I’ll “sand” them down a bit with a scrubby thing to make them smoother. There are doughnuts sitting in a box on the table with napkins. I want to eat one, but I’m not sure where they came from or who they belong to, so I probably shouldn’t. My head hurts. It hurt yesterday, too. I do not like this. I suppose I could walk down to Walgreens and get some Tylenol, but I took that last night and it didn’t really help, so I don’t think I’m going to bother. I’ll just suffer through it, I guess, and eventually get back to pottery. Okay, the bowls are fairly stiff, but I’m going to leave them a bit longer, just to be sure. I could probably start wedging some of the used clay so that I can throw another bowl, but then I’d be all messy. Of course I don’t want to be messy; nobody’s ever messy in the ceramics room. 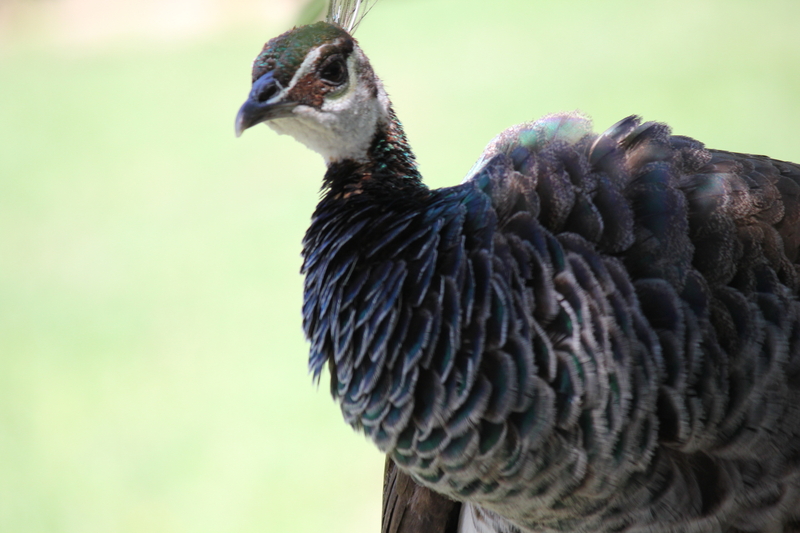 This is a peahen. She’s like a peacock, only she’s a she so she’s not shiny and colorful. I like her face. No, there isn’t really a point to me posting that picture; I just felt like one would be nice there. I should probably take pictures of my art so that the pictures I include relate somewhat to what I write. Maybe I’ll do that…someday. You must realize, I’ve been saying I’ll post pictures of my art for the last six years or so, and it’s only happened a couple times in that time, so it’s not likely to happen any time soon. Then again, it might. Maybe I’ll have a reason to gather up everything and pull out my camera. Maybe I’ll need to make a digital portfolio of all my work soon. But probably not. Time to go flip the bowls so that the bottoms can dry a bit. Then, I can trim/carve them/their feet. Oh joy. Bowls=flipped. Dented bowl=at the table with me, hopefully about to be fixed. I shall work on that a bit now while I wait for the other bowl bottoms to dry a bit more. There’s still one bowl that needs to be flipped, but it’s not ready yet. I also still need to throw two more bowls. I, so far, am not enjoying the throwing of the four+ pounds of clay. Why do the bowls have to be big? I’m back! Did you miss me? In case you’re wondering, I’ve got one ugly bowl trimmed but intact, one ugly bowl with a dip in it (a “spoon rest” so to speak) trimmed, one probably ugly bowl flipped and drying, and one ugly bowl trimmed unsuccessfully and squished. So that’s two that I can use, one that I hopefully won’t mess up, and at least three more that need to be made. This is SOOOOOO fun. Yup. I’m hungry. Maybe it’s sandwich time. Maybe not. I don’t really feel like eating my sandwich right now. What I would like to do is take a nap. But we know that’s not going to happen. I have a short written assignment due by 11:59 pm tonight. I suppose I could do that now; it’s not like I’m doing anything else. Soon, though, it will be time to trim a bowl, and then I shall have no reason not to wedge and throw some more, so I probably shouldn’t get started on something that will distract me from the pottery. Yeah. That’s a legitimate excuse, isn’t it? I’ve given in and taken a bite out of my sandwich. It’s yummy, but I wish I had ice cream. Ice cream is my favorite. Now my sandwich is all gone. Whatever shall I do? Guess I’ll be back after trimming a bowl and wedging clay and throwing some bowls. Again, I’ll be back before you even know I’m gone. I’ve been in this room for the last six hours. I started this post about four hours ago. My teacher left two hours ago, and all my classmates are gone. It’s only me and two ceramics majors doing their awesomely awesome stuff in the other room. One of them stopped by my wheel for a couple minutes and gave me some pointers, so maybe that will help with the next batch. I currently have four bowls, three trimmed. The fourth is drying. I almost had five, but then I ruined it. Now, I have to rewedge the clay again. I need to do a better job wedging; I had a lot of air bubbles in this round of throwing. My muscles are tired; I want to be done, but I’m not done yet. It’s now break time for doing that writing assignment that’s due tonight, I guess. Either that or I’ll just sit here for a while and do not much of anything. Yeah, that sounds like an exciting plan. I’m tired of writing here for now. I’m just tired, too. I suppose I’ll post this, finally, and start working on that assignment. Or maybe I’ll clean up a bit, go get some dinner and work on the writing, and then come back and get messy again. I guess that sounds like an okay idea.